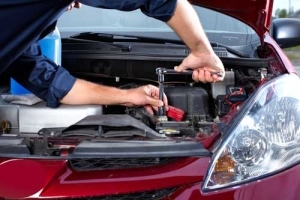 While they aren’t required as often, a regular tune up is still a valuable part of your car’s maintenance schedule. Remember tune ups? Back in the day, a tune up was something you had done every year, usually in the fall, so you’d be sure to have a nice hot spark through the winter months ahead. They’d replace the spark plugs, points, condenser, distributor cap, and rotor… basically everything in the ignition system that can develop wear. And they’d replace the air filter and fuel filter, and clean out the choke, so it closed properly and helped your engine start quickly on those chilly winter mornings. Then they’d make a few adjustments and, if the mechanic was any good, the car would start and run like it just drove off the showroom floor. Today, points and condensers no longer exist. The choke is gone… in fact, in most cases, the carburetor is just a memory, replaced by electronic fuel injection systems. And the fact is, those new fuel and ignition systems work really well, and they don’t need a tune-up each year. That’s not to say that the tune up is a thing of the past. Cars still need a tune up once in a while, just not as often as they did years ago. These days it’s more like every 50,000 miles or so. And because the performance doesn’t degrade as rapidly, many people forget all about having their cars tuned up… until it stops running entirely. To avoid that, bring your car to your local Cottman center. They’ll look over your vehicle’s maintenance schedule and let you know when it’s time to have your car tuned up. And they’ll tune it up using the latest parts and technical equipment, to bring your car’s performance back to showroom condition. At the same time, they’ll check all the filters and replace any that are getting dirty, to make sure your car can breathe properly. And, when they’re all done, your car will be running efficiently, with more power, better performance, and using less gas than before. So to get the most out of your car, bring it to your local Cottman center for its regular tune up. Because, yeah, your car still needs to be tuned up now and then.